Wrapping arms around a tree during the joyful play of youth or an adult’s impulsive hug seems perfectly reasonable and natural. The pejorative description of environmental activists as “tree-huggers” is archaic. Communing with nature is as inherent to us as it was to our ancestors. Dr. James Conroy, who has doctorate in Botany and Plant Pathology from Purdue University, gets past the woo-woo, right away by showing before and after pictures of distressed crops, trees, orchards and forests that he has helped invigorate and restore by communing with their bio-fields and using unique energy healing techniques that he designed. It’s impossible to miss the transformation, seeing is believing! Dr. Mehmet Oz says “As we get better at understanding how little we know about the body, we begin to realize that the next big frontier in medicine is energy medicine.” While scientists, physicians and healers explore how the bio-field relates to human health and healing, Dr. Conroy has been successfully using subtle energy to heal trees. 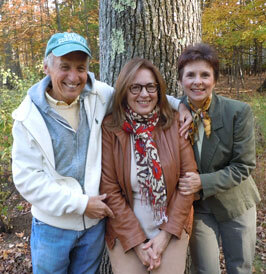 Taking the course in Tree Whispering with Dr. Jim and Basia that helped me become open to the energy expressed by plants and learn how to return my own energy to them. Often I feel my house plants reaching out to me as I passed by when they are a bit dry! And I was curious about the color auras I saw around some particular flowers. Now I can go even deeper communicating with my flowers, trees, organic garden and wonderful weeds. I loved the course! Many herbalists and naturalists experience direct perception from plants. Stephen Harrod Buhner’s books including, Secret Teachings of Plants, speaks to that, as did the colossal cabbages once grown at the Findhorn Garden in Scotland by the founders in the 1960s. Experiment with connecting to your trees and plants by touching them with an open heart and conscious awareness. Listen to what your intuition tells you and believe it!